Imagine one morning you wake up and learn that The United States is under attack from multiple fronts, our defenses overwhelmed by a previously inconceivable force. It’s not unlike 9/11, except on a much wider scale. Your plans for the day have just been changed. Different scenario: You are woken out of bed by the carbon monoxide alarm in your house. You can’t see or smell anything wrong, but it’s not a false alarm and without it, you’d meet a sad fate. In the first scenario, the threat is so obvious that the need for taking some kind of defensive action, perhaps even an offensive one, is equally obvious. Failure to do so could prove fatal. In the second scenario, the consequences of inaction are every bit the same, but the threat can not be easily seen. It has to be detected by other means. The United States is currently engaged in a “hot” war with multiple fronts, thankfully not on our soil. Less thankfully, many of the citizens of Iraq and Afghanistan have woken up to the first scenario, and have been forced to act accordingly. And although no one wants the war to continue any longer than required, losing the war is not an option. Yet on American soil, like the carbon monoxide threat that can not be readily seen, another war is now underway. It has many fronts, and the enemy force is organized, highly determined and well funded. It is also a war that we can not lose. This is the war on capitalism and free-markets. In many respects, it is the more important war. Consider first off that the terrorist forces that attacked U.S. soil in 1993 and 2001 recruit from regions of the world where poverty reigns. To a David with a highly questionable economic future, a chance at greatness via a terrorist act against Goliath begins to look more appealing. But the irony in what they are attacking is staggering. The economic system which defines America — “the land of opportunity” — is exactly the system that could be bringing these economically hopeless people out of their despair. The opposite is also true, as Steven Malanga has written, “free markets are rare in starving nations“. To whatever extent America weakens its most differentiating characteristics, we reduce our opportunity to be an example in how to best lift the world’s inhabitants out of poverty and into peace. With wealth and poverty being opposites, if we lament the latter, we must look to promote policies and practices that have demonstrated track records of creating the former. Likewise, free-markets and their resulting capitalism are inimical to war. They are the best peace-plan ever devised. It bears repeating: A truly free market between two trading partners makes both parties better off. Once this virtuous circle is in place, there is a greatly reduced incentive to go to war, as both parties are made worse off. Note that this precisely explains Russia’s reluctance to join in the chorus against Iran — they are huge trading partners. 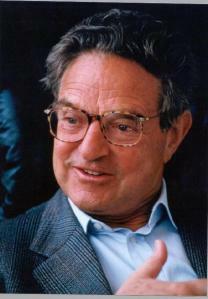 Under a rising tide of concern over Obama’s push of our economy into a more socialist-leaning direction, we have George Soros greasing the skids, with the goal of de-emphasizing free-markets in matters of public policy. This will be no small effort either, with a hoped-for endowment of $200 million. This is more than the combined endowments of many of the more notable free-market organizations. And the proverbial “carbon monoxide detectors” are going off with regard to the United States. Exhibit A is the value of the US dollar, which has been meandering downhill like a nice “blue” intermediate ski trail with black diamond sections becoming more frequently interspersed. Exhibit B is our exploding debt, which is finally catching more attention for what it is: blatant inter-generational theft. What’s truly mind-boggling about the efforts of Soros and his wealthy followers is that they decry the very system in which they became wealthy, the system in which they expand their wealth, in classic “I’ve got mine, close the gate” fashion. 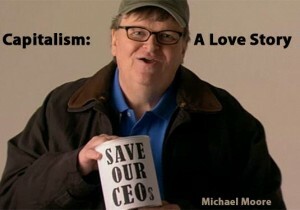 Witness Michael Moore’s “Capitalism, A Love Story” — in some countries, attacking the native economic system with such a movie would get him killed. This crowd simply doesn’t understand what free-markets and capitalism are. They think our economy, with its ever increasing regulations, corporate cronyism and government-as-backstop is a free market. Others have done a fantastic job at illustrating the ridiculous nature of such claims, very recently, Charlie Gasparino’s piece in the Wall Street Journal (expanded in his new book, “The Sellout“). Two other recent and noteworthy books, Thomas Woods’ “Meltdown” and Thomas Sowell’s “The Housing Boom And Bust” also make the methodical, crystal-clear case that big, interventionist government itself was the primary cause for our recent financial crisis. None of this would matter if the anti-capitalists didn’t have the full mind and ear of the legislative and regulatory arms of the federal government right now. The damage that could be done in just one 2-year congressional term is incalculable. Ronald Reagan’s “shining city on a hill” runs the serious risk of tarnish. In the opening example of a sudden “hot” war in our backyard, we would all literally leap to our feet and do anything and everything required to defeat the enemy. Yet surely and silently an enemy operates in our midst whose worldview can more easily lead to the “hot” war. When will we leap to our feet to defeat it once and for all? It’s time to admit the truth: the war in Iraq is due to oil and government contracts to private companies, not knocking down the Towers and killing so many Americans. The White House knew these terrorists were in the country and did NOTHING! They waste time and money chasing after Mexican illigals who do us no phyiscal harm, and are doing jobs most American lazy pelple will not lower themselves to do! QUIT LYING TO THE AMERICAN PEOPLE ABOUT why we are in Iraq! We have oil resources here in American we could appropriate but for the goody two shoes who are on the side of minows, the gnats, the rats and the worms on the earth and care nothing about the people. Save the Whales, sacrifice the people! This country is being led by IDIOTS who are only interested in lining their pockets. WANT TO BE RICH? BECOME A CONGRESSMAN! While I am not a liberal, I did vote for Obama and I sincerely hope that he turns around and does what is best for the country and the majority of it’s citizens. Moore is right about Obama using what he has while he has it. The Republicans have found a common enemy for themselves and a good portion of the whites in America, and that enemy is Obama. They couch it in several terms, but it all boils down to racism. I never thought I’d live to see white Americans revert to racial attitudes that I thought were dead, but we can’t deny what has happened. I remember my Dad and uncles changing partys back in the 60s because of the Civil Rights Act, and I remember why. It’s the “southern stratagy” all over again, but this time on a national scale. It makes me sick to hear people who I thought were open-minded Christians say the things they say. It makes me ashamed to be considered one of them. Substantially, the post is actually the best on this valuable topic. I agree with your conclusions and will thirstily look forward to your coming updates. Just saying thanks will not just be adequate, for the tremendous clarity in your writing. I will immediately grab your rss feed to stay informed of any updates. Fabulous work and much success in your business endeavors! Thanks for this great read. I definitely enjoyed every little bit of it. I have you bookmarked and will be checking back. Hi, just read this blog, found it on my usual surfing tangents. Cheers. Very interesting post. I would like to link back to it…. Hi, I found this blog post while was searching for health care related information on msn and found it very good article, thanks for sharing, best regards and cheers! I recently came accross your blog and have been reading along. I thought I would leave my first comment. Nice blog. I will keep visiting this blog very often. We will not. We will instead ignore the shrill alarm, pretending instead it is our neighbor’s car alarm or some such nonsense…and we will perish in our beds, covers pulled over our head to drown out the sound.